Dade City, Dec. 31.—(Special. )—The Lake View Highlands Hotel, on Lake Pasadena, was burned this morning. Only a few guests had arrived and they escaped in their night clothes. The proprietor, Mr. Chas. J. Ramsdell, had just spent one thousand dollars in putting the hotel in thorough repair, preparatory to the opening on January 1. He had every room engaged for the season. The hotel was insured for about one-fourth of its actual value. The proprietor’s loss is estimated at $20,000. The people of Dade City and Pasco county have suffered a great loss in the burning of the hotel, as they were all invited to attend a reception at the hotel tonight, which is a great disappointment to all. The hotel was located on Lake Pasadena Road, about one half mile west of Chesterfield Road, according to Wilbur Dew. This article appeared in the Dade City Banner on Aug. 31, 1926. Oakhurst, Aug. 30—(Special to The Banner)—Driving along the Fort King highway the other day, trying out the new paving, we stopped at the new filling station just opened by Fred T. Himmelwright (picture, picture). It is located on the top of LeHeup hill, one of the beauty spots of Florida. This filling station has an unique feature the writer has never seen before in any filling station. Mr. Himmelwright had observed that while there was a splendid view of Lake Pasadena from the road, it was not quite high enough to do justice to the surrounding hills, so he proceeded to add a high tower to his building from which the whole surrounding country can be seen. The tower contains a comfortable room, all glassed in, for cool or stormy weather, and is fitted up with chairs so that visitors may enjoy rest and the glorious scenery at the same time. It is to be hoped that Dade City and Zephyrhills people will not only stop and see their own section, as it really is, but to see that every tourist coming into this section gets this view of Pasco’s mountains and lakes. This tower is free to every one and the more people who stop and enjoy the scenery, the better Mr. Himmelwright will like it. The filling station also contains a cosy little parlor and restroom for tired travelers and other conveniences. There is a stock of goods that travelers need, also a good, large dining room, where light lunches will be served. Bottled soft drinks are now being sold, but as soon as Florida fruit is in the market, drinks made of real fruit juices will be served and at 5 cents a glass, too. Mr. Himmelwright has just completed a beautiful bungalow nearby, with all up-to-date features. He has his own water and electric light plant and everything of the best. All told, the improvements have cost $8,000 and go to make a very fine improvement. The grounds are now being graded and beautified, but, alas! we are still cursed with range stock, so that the grounds must be heavily fenced. I should mention, too, that there is a fine piece of timber on the place nearby, that will be ideal for picnic parties, which Mr. Himmelwright gives the use freely to the public, in fact, a person gets the idea that most everything around there is for the free use of the public, something new in filling station ideas. This article appeared in the Dade City Banner on Feb. 4, 1927. Nowhere, in the travels about this state (and they have been considerable in the 32 years he has lived here) has the writer ever seen a more beautiful section than is found four miles south of Dade City, in which is generally known as the Sand Pond neighborhood. It is a section of high hills that extend in every direction, with valleys in which nestle lakes, forests, groves farms, in a bewildering profusion. Here one easily receives the impression that he is standing on the roof of Pasco county, if not of Florida. A short ride through this region the other afternoon brought many interesting sights to view, and disclosed that those making their homes here are doing much to develop this part of the state. Blessed with a neighborhood of rare scenic beauty, with fertile soil, and many sparkling lakes, they are a people who indeed are blessed, being in a position to enjoy all the advantages of rural life, with the attractions of two growing cities but a few minutes’ drive distant. The start was made out over the Fort King highway, that historic road, the first ever constructed in this part of the state. In the beginning its purposes were merely military, for built in 1825-26, it ran through a country peopled only by Indians, and was intended simply as a means of communication between Fort Brooke, now Tampa’s bustling water front, and Fort King, located in what is now the environs of Ocala. Over this road marched Major Dade and his devoted body of men to be massacred on December 24, 1835, and during the seven bloody years of war that followed, many skirmishes and battles were fought on or near it. Last year, after a century of existence, the section lying between Dade City and Zephyrhills was paved, a fitting centennial observance. But enough of history. Let us go to the present. Out through the Oakhurst section our Elizabeth rolled, purring like a Packillac, as her tires sped over the asphalt. Past the cozy home of J. L. Bromley, the Faust vineyard and home being on the opposite side of the road. Here we glimpsed the fields of J. L. Slemp, green with winter pasture, and there is the forest-shaded residence of D. C. Mullen, that Montana pioneer who is passing the evening of life in this sunny clime, and who resembles the late Samuel L. Clemens so closely in appearance that he might be mistaken for the humorist Mark Twain himself. On the southern slopes of yonder hill are the young trees composing Gloria Grove, and while those nearest the valley show signs of having been nipped by the frost king, those higher up bear testimony to the warming influences at all times of Pasco’s hills. Back yonder, hidden from the road, is the truck farm of the Loy’s and on this place where the natural growth has been left, is the home of Waldo Richardson, who has done much to build up the poultry industry in this section. But now we are approaching the section we wished to visit. Here is Cedar Park, recently purchased by a Tampa business man named Glover. And what is this? Tractors, and men plowing up the mellow, yellowish sand-clay loam, not in small fields, but over large areas. We must investigate this. Inquiry brings forth the information that preparations are going forward for developing a large truck industry. Part of the place is to be set out in Marvel blackberries, a considerable acreage will be planted to Irish potatoes, and other vegetables many sorts will soon be flourishing here. A stop is made at the home and gift shop of Mrs. Liska Stillman Churchill, who is found busily engaged in painting some Rosicurian altar sets to be sent to devotees in far-off California. This charming lady shows us some of them, all the work of her own hands and made of native Florida woods—pine and bamboo. Mrs. Churchill’s combination living room and shop is an interesting place to visit. Rare old tapestries on the walls, many beautiful pieces of chinaware, curios of varied designs and from a great many places, attract the eye everywhere. Gifts of Florida products, however, are her specialty. Here we saw the original pattern for the present styles of ladies’ garments, a dress complete, two and a half feet long that was originally worn by an Indian flapper in Panama. Leaving the house we walked up to the top of the hill on whose slope is located. A breath-taking climb it is, and when at the top one has gone over a quarter of a mile. But the view well repays for the exertion. Range after range of hills stretching to the south, to the east a broad valley dotted with homes and groves, northward four miles away Dade City nestles, looking like a toy town, and eight or nine miles beyond, the smoke of the big Lacoochee mill like a cloud on the horizon. On the west one gets glimpses of Lake Pasadena, stretching to the foot of the hills beyond. This is said to be the highest spot Pasco county, and it certainly looks as if the claim is well founded. Returning to our flivver we climb LeHeup hill in high gear, something Elizabeth would never do before the paving was laid. Here Fred Himmelwright has built an attractive lunch room and filling station (picture, picture), and we climb the stairs to the observatory on the roof. Another view of beauty is unfolded, with Pasadena Lake dimpling in the sunshine at our feet. Returning to the ground we learn that Mr. Himmelwright is away, working on his grove, which his wife says was unharmed by the cold. The drink she serves us, made entirely of fruit juices, certainly does not taste as though the oranges and grapefruit of which it is composed were injured. Down the hill and a turn to the right on a dirt road. Here is the home of Rev. Dr. Wesson, with its seedling grove apparently untouched by frost. Up a stiff rise and we find the attractive home of D. D. Covington, one of Dade City's energetic young business men. His grove appears in fine shape, and we learn he is arranging to enlarge it considerably. Up another hill and past Island Farm, now in charge of Horace Simms. A small cabbage patch is glimpsed from the road here. A sharp turn and we pass Mrs. Dormany’s home and grove, surrounded on two sides by arms of Lake Pasadena. This lake is the largest in Pasco county, and, according to reports, has never been correctly mapped. It is impossible to see all of it at one time, it turns and twists so. Old settlers called it Lake Buddy, and tradition has it that the Indian name was a word signifying “crooked.” It abounds in fish and is a sheet of water of rare beauty. Through a beautiful high hammock we go, till a fence stops us. A gate admits us to a grove and we are at Alpine Grove, the home of C. H. Himmelwright. A walk through his grove, which shows no sign of frost, while the mandarins and other fruit that we sample is perfection. The view back towards the north is thrilling and the Country Club and water tower at Dade City, seven miles away, are very plainly visible. From Alpine Grove the trip back to the highway is made over a newly graded road, then we turn south again till we reach the home of H. B. McKillips, where we turn eastward and over another new road climb the high hill to Highland View, the L. R. Bailey home. Here we find slight, if any, damage from cold, and an avocado tree, about four feet in height, shows no signs of ever having known what frost is. The Willis and Pinholster grove across the road also appears to be unhurt. The view from this hilltop is a beautiful one, but circumscribed by other near-by hills. Here we start on our homeward trip, going down the hill to the Wire Road, another historic highway, so named because the first telegraph line in this section was built along it, over Greer hill, from whose top we again glimpse Dade City, five miles distant, and which we reach in the glow of early evening. This article appeared in the Tampa Tribune on Apr. 10, 2004. LeHeup Hill gets all the glory. It’s thought by most to be the highest point in Pasco County, and at one time it was a contender for the highest point in Florida. The summit, south of Dade City along Fort King Road, doesn't top the list. But it’s the state’s 23rd highest point above sea level, according to America’s Roof, americasroof.com, an organization that records such things. But for a brief time in 1936, another Pasco County “mountain” vied for the title along with LeHeup Hill. “Pasco Claims Highest Points in Florida,” the Jan. 10, 1936 edition of the Dade City Banner proclaimed. But the so-called highest point wasn't LeHeup Hill. It was the farm and grove property three miles northwest of Dade City purchased by L.E. Rowland, principal of Zephyrhills High School. Rowland believed the land was 330 feet above sea level. From his home on the “brow of a hill” accessible via a little traveled road “can be seen a remarkable panorama of the eastern half of the county showing Dade City, the mills of Lacoochee, hills, lakes, groves and homes for miles around,” the article stated. The view from there was unobstructed to the north and south. “But the longest distance can be seen to the east across the low river swamps between Dade City and Orlando,” the Banner said. Rowland had reported seeing smoke from trains between Lakeland and Orlando and, at night, airport lights in Orlando, Lakeland and Plant City. And a “glow in the sky” came from Tampa and Brooksville. But Rowland was most amazed on clear days to see smoke moving in the far distance. From its comparatively slow progress, Rowland believed it came from coastal steamships. Rowland wished he could have measurements taken to measure his property against LeHeup Hill. Many years earlier, Dade City, Clermont and other Florida towns were claiming the highest land in Florida, the Banner said. Dade City’s claim was the property of Gertie M. Dew on Fort King Road. The site, now called LeHeup Hill, overlooks Lake Pasadena and was measured at 330.2 feet above sea level, slightly more than the height given the Rowland property, the article said. But “which ever point is finally proved to be the highest, it is certain that no other section of the state can surpass Pasco County in the height of its hills and beauty of its views,” the Banner said. 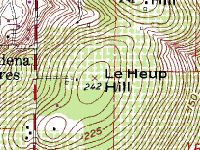 LeHeup Hill is now designated at 242 feet above sea level, records show. Not making Florida’s Highest Named Summits list is Clay Hill, six miles northwest of Dade City, recorded at 301 feet. That would make it the highest point in both Pasco and Hernando counties. Frazee Hill, at 251 feet above sea level and perhaps where the Rowland property was located, even tops LeHeup Hill. But still the hill named for the family that moved there in 1911 gets the glory as Pasco’s highest point. Its adjoining Nursery Hill, also 242 feet above sea level, and nearby Greer Hill, at 229 feet above sea level, both made the Florida Highest Named Summits list. The highest summit on the list is Britton Hill, at 345 feet above sea level, in Walton County. This article appeared in the Tampa Tribune on May 6, 2003. The community of Pasadena existed only for a brief time in the late 1880s and 1890s. But plenty of history remains in the area surrounding what’s now called Lake Pasadena, southwest of Dade City. The first known residents date to the 1780s when the village of Toadchudka was settled by Eufala Seminoles. They arrived in Florida from Eufala, Ala., in 1767 and later settled what was also called Etowahchutka. It was abandoned about 1836, presumably because of the start of the Second Seminole War. Artifacts also have been found in the area to indicate nomadic people came here more than 10,000 years before to make tools from the outcroppings of agate coral that were prevalent then. This manufacturing site covered several square miles at the south and southwest part of what is now Lake Pasadena. The Toadchudka Seminole Village was located just east of Williams Cemetery on Williams Cemetery Road, west of today’s Prospect Road. Williams Cemetery is the resting ground of many of the early settlers in the Pasadena area, as well as the nearby community of Prospect. The cemetery was started by the Williams family, who deeded two acres. An additional 4 acres was bought from the Hawes family. The story has it that the Williams family allowed a group of travelers to camp on the hillside and, upon returning home from a trip, the Williamses found the visitors had been killed, possibly by American Indians. The visitors were buried in a mass grave that never has been located. Each time a new grave is dug in the cemetery, evidence of that early mass grave is sought. The Williams Cemetery Association was organized in the early 1900s and owns the property west of Prospect Road. Tombstones in the oldest part of the cemetery have been weathered to the point the writing is obliterated. The cemetery includes four and five generations of families including Cripe, Dew, Gaskins, Osburn, Williamson and Wells. Jacob Wells, one of those buried there, came from Madison County in 1842 and set up a home near Riggs Hammock on what originally was Handcart Road, now Prospect Road. A community developed there called Prospect, about two miles south of State Road 52 where today’s Prospect Road curves west. A log church was built in 1855 and also served as a school. The first Prospect church closed in 1868 but a second was built in 1887 by Jack Osburn and Jack Gaskins on 20 acres deeded by David Osburn Jr. and his wife, Sally Kersey Osburn. The congregation joined the Florida Methodist Conference, and in 1940 the building, then known as Sand Pond School, was purchased for $100 by Med and Mae Stanley Gaskin. They used it for a residence on Fort King Road. The second Prospect church had been located a few hundred yards north of the original church, about a mile southwest of the south end of the lake that took the name of a pet bull in the 1830s. According to legend, a covered wagon traveling along Fort King Road with a herd of cattle stopped for water. Most of the cattle drank from shore, but Buddy the bull waded in and wouldn't budge when it was time to move on. Some say Buddy waded out so far he drowned, while others say the stubborn bull left the water when he was ready and caught up with the herd. The lake became known as Buddy’s Lake, then Buddy Lake and finally Lake Buddy. 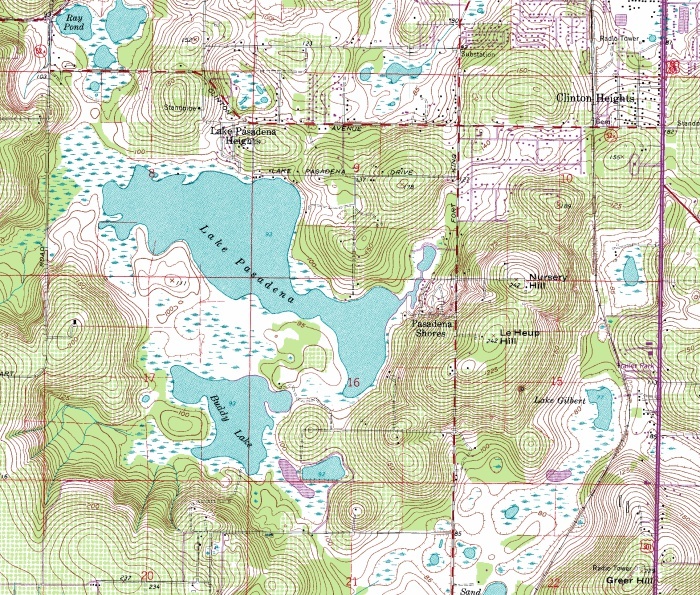 The community of Prospect was also known as Buddy Lake Settlement. Lake Buddy became Lake Pasadena in the 1880s when the wealthy community of Pasadena sprang up with profits from the citrus industry. Lake View Highlands Hotel. Image courtesy of the Pioneer Florida Museum. 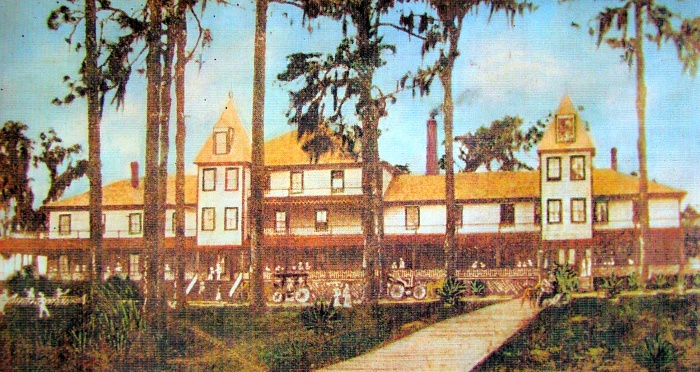 The Lakeview Highlands Hotel, located not far from Pasadena and Chesterfield roads, off Clinton Avenue, was built about 1888. It was a luxury hotel where wealthy visitors from the north vacationed. But the freezes of 1894 and 1895 ended the prosperity of the community and the hotel, which burned in 1899. The historic Pasadena Church, at 36134 Clinton Ave., is the only remaining structure from the grand old days. The church, built in 1880s, also served as a community social center and, from 1888-1988, as a polling place. The church was purchased in 1932 from the Methodist Conference and preserved by the Fort King Home Demonstration Club, forerunner of the Pasco County Extension Homemakers Clubs, now called Family and Community Education Clubs. The structure was returned to a place of worship in recent years when it was bought by the Living in Faith Fellowship. Also considered a historic site in the Pasadena area is the Solberg House, 11211 Fort King Road, between Waterfall Drive and Lake Pasadena Road. The Georgian-style house was built about 1915. Sverre Solberg, a Norwegian ship captain, bought the house in the early 1930s from Toombs and Lyman Dairy. Solberg served as an officer of the Lykes Brothers Steamship Lines, headquartered in New Orleans. While he was at sea, his wife, Belle Mead “Billie” Solberg, had 10 acres cleared for a citrus grove. Sometime after she was widowed, Billie Solberg moved to a smaller house nearby. Her original house is now owned by Kimberly L. Michaels. Just south, at 10550 Fort King Road, is the Dew Home. The rural Florida-style house was built in 1913 by William Dew, Charlie Knapp and Howard McKillips. The single chimney that supported three fireplaces was one of the first in the area. And the two bedrooms and a portico upstairs afforded a grand view of the countryside. Except for an open north porch upstairs that has been removed, the house has retained its original characteristics, complete with the tin roof. Grace Cripe married Dew in 1929, and they moved into the house in 1943. After William died, Grace lived there until she died in July 2000 at 96. The house remains in her estate. Across Fort King Road, on the west side, is a house ordered from a Sears catalogue by Fred T. and Lizzie Himmelwright in 1926. The next year, the Himmelwrights built the Linda Vista (Spanish for “pretty view”) Store next to their home. The country store sat atop LeHeup Hill, overlooking the communities of Pasadena, Prospect, Dade City, Saint Leo, San Antonio, Sand Pond and Zephyrhills. Linda Vista had a lunch counter and a large sitting room for community events. Outside were gas pumps. Travelers proceeding south on Fort King Road from LeHeup Hill will pass the historic sites of the Freedtown and Earnestville communities. On the south side of Lake Pasadena, near Bozeman Road, is the site of Earnestville. It was settled about 1875 when Elijah Embree Earnest and wife Virginia opened a store on Lake Buddy. The freezes of 1894 and 1895 hit the community hard, and its post office closed in 1899. The freezes also caused residents to abandon Freedtown. It was established about 1869 by recently freed slaves near the end of what is now Bozeman Road, off Fort King Road. The settlement lasted for a generation, with log cabins, a cemetery and an African Methodist Episcopal Church. The buildings were torn down and the cemetery covered over. Church members moved to Dade City and founded Mount Zion AME Church.